From the author of Hour of the Bees comes another captivating story that deftly blurs the line between reality and magic — and will leave you wondering What if? The Loch Ness Monster. The Frogman. Bigfoot. Twelve-year-old Miranda Cho used to believe in it all, used to love poring over every strange footprint, every stray hair, everything that proved that the world was full of wonders. But that was before her mother’s obsession with monsters cost Miranda her friends and her perfect school record, before Miranda found the stack of unopened bills and notices of foreclosure in the silverware drawer. Now the fact that her mom’s a cryptozoologist doesn’t seem wonderful — it’s embarrassing and irresponsible, and it could cost them everything. 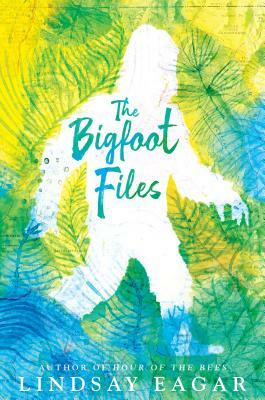 So Miranda agrees to go on one last creature hunt, determined to use all her scientific know-how to prove to her mother, once and for all, that Bigfoot isn’t real. Then her mom will have no choice but to grow up and get a real job — one that will pay the mortgage and allow Miranda to attend the leadership camp of her dreams. But when the trip goes horribly awry, will it be Miranda who’s forced to question everything she believes? Lindsay Eagar is the author of the middle-grade novels Hour of the Bees, which was an International Latino Book Award winner and was short-listed for the Waterstones Children’s Book Prize, and Race to the Bottom of the Sea. She lives in the mountains of Utah with her husband and two daughters. Eagar has a beautiful way with words. Her complex internal dialogues and descriptors allow readers to visualize, in minute detail, every physical and mental aspect of each character and their current surroundings. Eagar continues to show her talents as a writer in her third novel, which is rooted in Miranda’s internal struggles. Readers hoping for a zany creature caper should look elsewhere, but those who appreciate introspection will be absorbed by Miranda’s circling thoughts, worries, and anger, and what turns out to be an eye- opening adventure marked by danger and the fantastic. Eager (Race to the Bottom of the Sea) crafts an appealing novel about 12-year-old Miranda Cho—a straight-A student, compulsive list maker, and unlikely student body president...Eager makes a case for belief—in the uncanny, sure, but most of all in the people one loves. The message of acceptance toward people is a sound one, though, and readers with sneaking suspicions about what lurks in the woods will relish the confirmation. A spiraling, effusive third-person narration amplifies both the wildness of Miranda’s thoughts and the awe-inspiring, almost mystical forest...an engaging yarn that blurs myth and reality.